The Chef (Pardaman Singh) at Pind Baluchi is from a small town called Meerut, near Delhi. He completed his hospitality qualification in April 1995 from Meerut. From there he never stopped and kept moving forward. He started his first hospitality job in May 1995 from “Delhi Sofitel Surya”, and then moved to “Park Royal” in Delhi then a big move to “Royal Court” in Kenya as a head Chef in 1998. 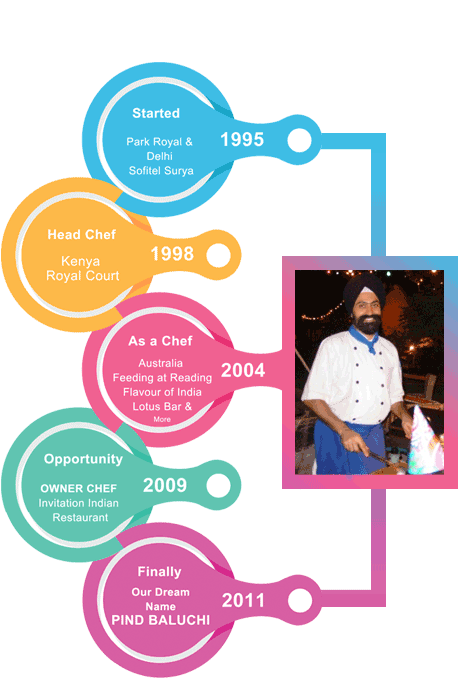 Pardaman Singh worked in “Royal Court” for 2 years and then moved to “Southern Palm Beach Hotel" in Kenya as a Sous Chef. After working in Kenya for another 3 years he came to Australia as a skilled migrant with his small family. Pardaman started his journey in 2004 in Australia as a Chef in “Flavours of India” on Commercial Road. After working for a few years, he joined “Feeding at Reading” in South Melbourne and “Lotus Bar and Restaurant” in South Yarra and then “Big Mouth” at St Kilda. He was looking to start his own business for all these years and finally got the opportunity in 2009. Since then he has been successfully running this restaurant.